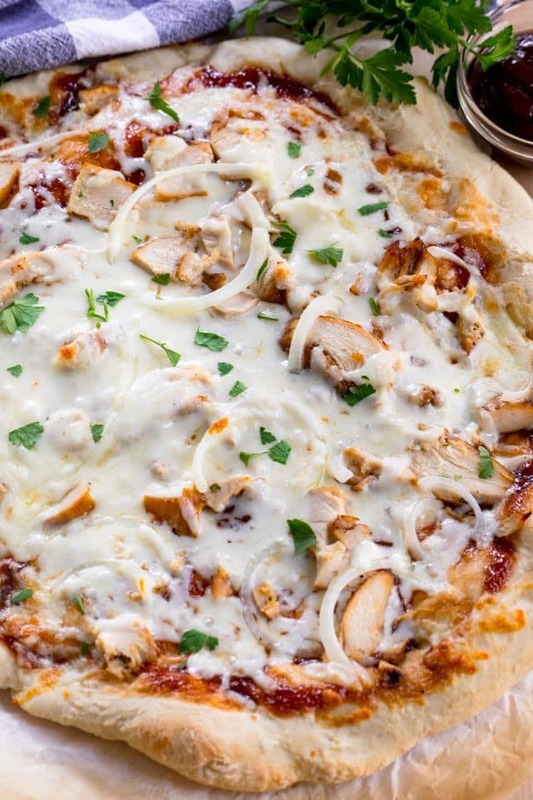 Easy homemade BBQ Chicken Pizza is the perfect easy weeknight meal or dinner recipe! 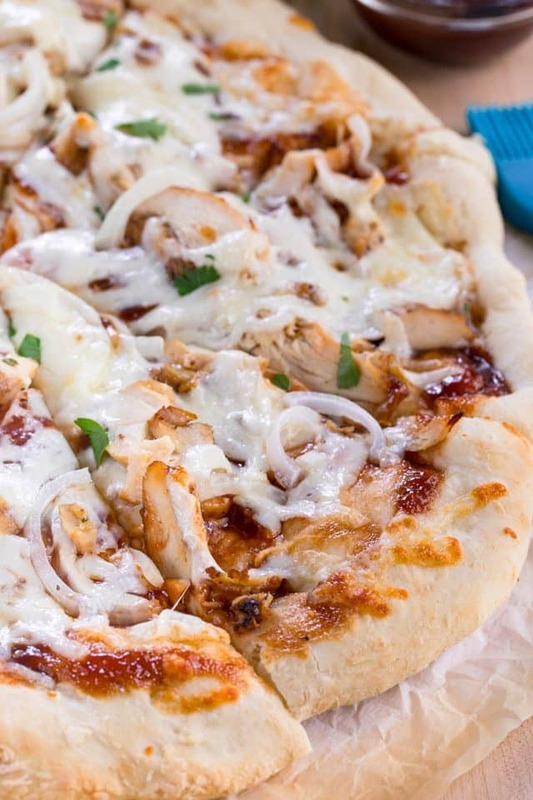 This easy pizza recipe has chicken, cheese, and BBQ sauce all on a homemade pizza crust. It’s the perfect copycat recipe! As BBQ pizza became more popular outside Domino’s, it began to show up on appetizer menus all over the place, making it harder to avoid. One time I snuck a piece off a friend’s plate and decided my boycott of this delicious pizza was unfounded. BBQ sauce can belong on pizza! 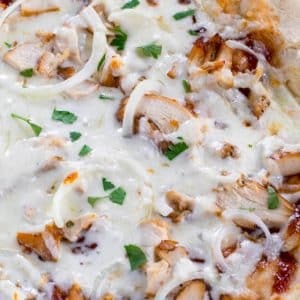 Making a BBQ Chicken Pizza at home is really easy to do and it tastes so much better than when you order it from take-out. You get to control the ingredients, making this easy pizza recipe perfect for weekly dinners. And: you can make it as easy as you want. The idea of a BBQ Chicken Pizza can go from completely homemade to semi-homemade in several different steps. What’s on a BBQ Chicken Pizza? Pizza Dough – which you can buy from the store, in a can, or you can make my ultimate pizza crust recipe. BBQ Sauce – use your favorite kind. I love a honey barbecue sauce but use the brand and flavor you most enjoy. Mozzarella Cheese – do yourself a favor and don’t buy it shredded. Pre-shredded cheese has some sort of weird coating on it and it won’t melt as nice as in these photos. Red onion (or yellow) – sliced thin so it’s not too much of a mouthful. Chicken – you can use shredded rotisserie chicken or leftover chicken breasts like I do. I bake a bunch of chicken on Sundays and eat it all week in recipes like this pizza. I absolutely love making my BBQ Chicken Pizza with my homemade crust recipe, but sometimes life gets in the way. That’s when I’ll stop by the deli section of my specialty grocery store for some pre-made dough, or in a pinch grab a can. How do you cook a crunchy pizza at home? My best tip for cooking pizza at home is HEAT. Make sure that you preheat your oven to 500°F and preheat your pan too. I place my pizza pan (or a cookie sheet or pizza stone) in the oven while it’s preheating. Build your pizza on parchment paper and carefully transfer it to the hot pan. This will help sear the bottom of the pizza and give it a nice crunchy texture while staying soft and chewy. However you make this easy pizza recipe, it’s the perfect dinner or appetizer. BBQ Chicken Pizza is my new favorite! 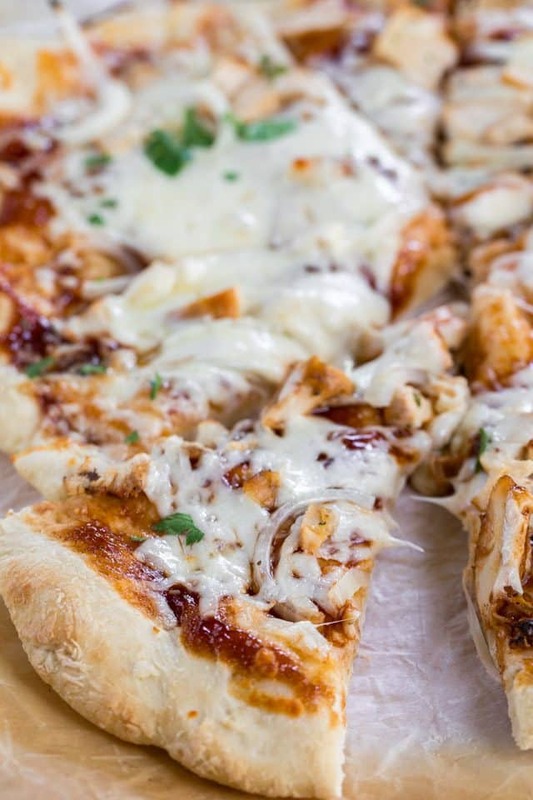 Easy homemade BBQ Chicken Pizza is the perfect easy weeknight meal or dinner recipe! It's a great copycat recipe! Preheat oven to 500°F. Place a pizza pan or baking sheet in the oven to preheat. Stretch and roll pizza dough to a 10-12 inch circle onto a sheet of parchment paper. Top pizza with sauce, cheese, chicken, and onion. Carefully place pizza (on parchment) onto hot pan in oven. Bake until crust is golden and pizza is cooked through and toppings are melted, 10-20 minutes. Cool slightly before slicing. 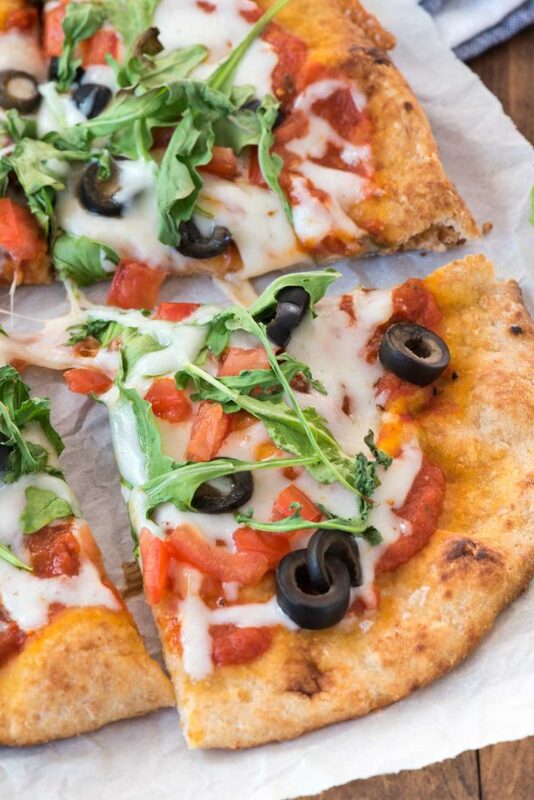 Arugula Pizzas are a quick and easy pizza recipe using flatbread. 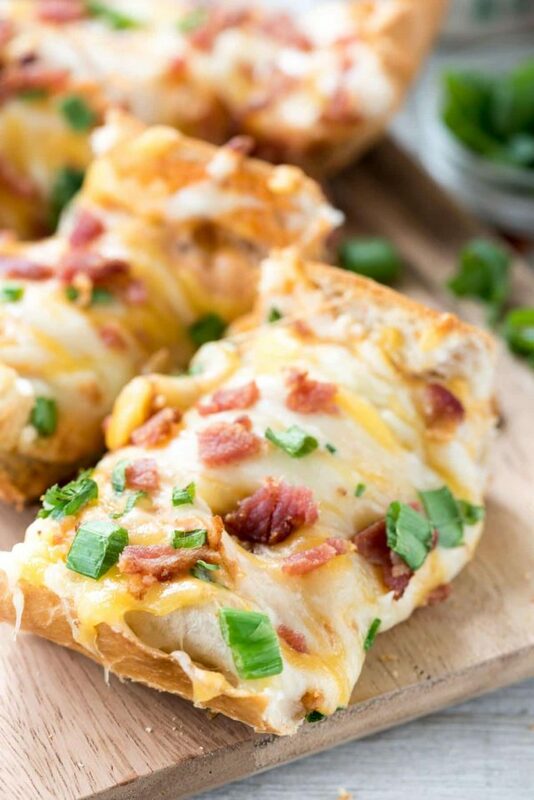 Bacon Ranch French Bread Pizza can be made on a regular crust also. 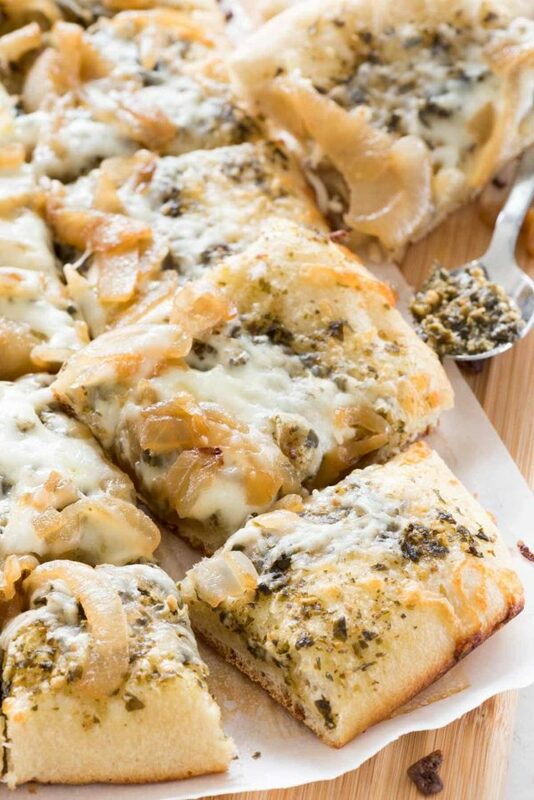 Caramelized Onion Pesto Flatbread is one of our favorite appetizers. oh yum.. this look so good!